Brazil has just reached the historic mark of 300 MW of installed capacity in distributed generation of solar photovoltaic in residences, trades, industries, rural producers and public buildings. In installed system numbers, residential consumers are at the top of the list, accounting for 76.9% of the total. Next, there are companies in the commerce and services sectors (16.2%), rural consumers (3.4%), industries (2.5%), public authorities (0.8%) and other types, such as services (0.1%) and public lighting (0.02%). According to the entity, Brazil currently has 32,033 solar photovoltaic systems connected to the grid, bringing economic and environmental sustainability to 38,270 consumer units, totaling over R $ 2.2 billion in investments accumulated since 2012, distributed around all regions from the country. The webinar is including an Q&A with the speaker Dr. Rodrigo Lopes Sauaia (ABSOLAR) at the end of the presentation. Don´t miss it! If you will not be able to attend, but interested in the presentations or webinar records, feel free to register here. Co-founder and chief executive officer (CEO) of the Brazilian Photovoltaic Solar Energy Association (ABSOLAR – Associação Brasileira de Energia Solar Fotovoltaica), the national association representing companies from the whole PV value chain with operations in Brazil. Co-founder and member of the board of directors of the Global Solar Council (GSC), the global entity unifying and representing the solar power sector at an international level. Strategic advisor on Photovoltaics for Greenpeace Brazil. 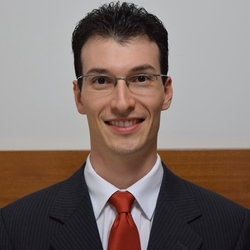 His academic background includes a PhD with honours in Engineering and Materials Technology from the Pontifical Catholic University of Rio Grande do Sul (Brazil), with an international collaboration with the Fraunhofer Institut für Solare Energiesysteme (Fraunhofer ISE, Germany), a M.Sc. with honours in Renewable Energy with PV Specialisation from the EUREC Master Program, with an international collaboration with the ETH Zürich (Switzerland), and a B.Sc. with honours in Chemistry from the University of São Paulo (Brazil).